Chrono Trigger was both announced and released today for Steam. Only $15. "Loaded with upgrades." I'd be crazy not to. Be careful, I heard there are some issues. It also seems to be a port of the phone version, and there are some graphical issues. Might want to wait a bit. Should have looked before I leapt on that one. It's still Chrono Trigger, though. I've put up with lazy square ports for lesser games. As long as you never plunked down the money for Final Fantasy: All the Bravest Pak... because if you did, I honestly feel very bad for you. 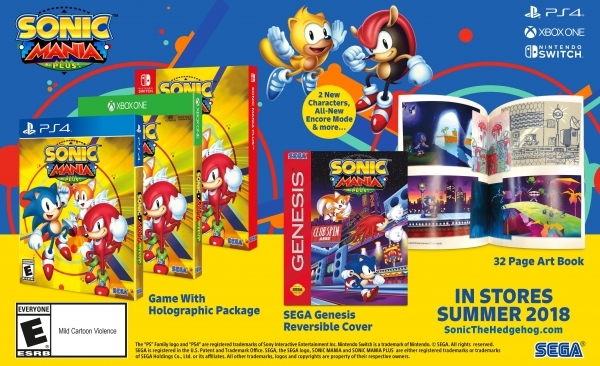 To celebrate the 5th anniversary of the mobile game 'Sonic Dash,' Sonic is now a playable character in 'Pac-Man,' while Pac-Man and Ms. Pac-Man are playable characters in 'Sonic Dash'. There was a 34 minute video released by Nintendo today that served the sole purpose of informing us that our lord and saviour, Massive Hero Soccer Guy, is releasing a new Smash Bros game for the Switch. So Sea of Thieves is out today. Anyone trying it? Looks like it has the potential to be fun. And I haven't heard the name Rare in a long long time, guess they are back now? It's a windows 10 exclusive though, and not on Steam, so I'm going to wait until I hear a lot of good things before giving it a shot. Windows 10 and Xbox One! I'm asking for a copy for my birthday next week. I don't usually do these online-only affairs, but this looks like too much fun. High hopes! They seem to be having some server issues with Sea of Thieves, they were not expecting 5000 people a minute signing in so the servers are a bit overloaded during peak hours. The developers made a video explaining the situation and what they were doing about it, now that's how you handle opening day issues. I also don't do online only multiplayer, but this one is tempting. Be careful. So far I’m hearing it’s fun if you are with a group of friends, but it’s annoying and near impossible to play alone. And the random people you can be matched with online either try to immediately kill you or have no interest in teamwork. Still would like to try it, but I’m hesitant to put money down on it. I also remember enjoying Chrono Cross, but I was pretty young and not very critical when I played it last. Anyone remember if it’s actually any good? I just back into playing Legend of Zelda the Minnish cap for my 2DS and... I'm not even on the 2nd level of the game and I'm already stuck trying to climb up the base of this mountain, I just keep running into puzzle after puzzle and frankly... it's getting very annoying. Think I'm just gonna go play me some Link to the Past. At least that game I can beat.